LEGO Ninjago sets offer all the options for unlimited building playtime based on this year’s most exciting LEGO movie! Thrills and chills move from the big screen to your tabletop with everyone’s favorite interconnecting building bricks! Choose one or more action sets for your holiday gift giving. Everyone’s favorite interconnecting building blocks spark your imagination when you assemble the Fire Mech and recreate scenes from the LEGO Ninjago Movie with this amazing building kit! Movie character blocks enhance the experience as you direct the lights, camera, and action! Hours of fun you can enjoy again and again. If the Green Ninja is your favorite LEGO Ninjago Movie character, then you will want this action-ready Green Ninja Mech Dragon building kit! We’ve added in key characters and their weapons for a more exciting table-top adventure. Bring your own popcorn — you’ll feel like you’re at the movies again! LEGO gives new meaning to the term “action” with this thrilling building set featuring the Ninjago Movie Temple of the Ultimate Ultimate Weapon! Spectacular detailing, including character figures, their weapons, and all the secret rooms in the temple make THIS the “ultimate ultimate” gift! There’s even a spider and snakes! What would the Ninjago Movie be without the imposing Water Strider? When you get this LEGO building kit you will intimidate your opponents each time you reenact the battle scenes on your own tabletop! Characters, weapons, and accessories included. Just add imagination and bring your favorite LEGO movie to life. If the Green NRG Dragon building kit isn’t the most fun outside the LEGO Ninjago Movie, then you need to see it again! Complete with action figures, weapons, even a catapult! You’ll fly high with Lloyd as you live the Ninjago dream. Powered by your imagination, the sky’s the limit! Can you take on Jungle Garmadon? Get the LEGO Ninjago Movie Master Falls building set and let the battle begin! Minifigure characters and weapons give you worthy opponents as you battle to see who goes in the cage and who will go in the water! Then explore the hidden cave! 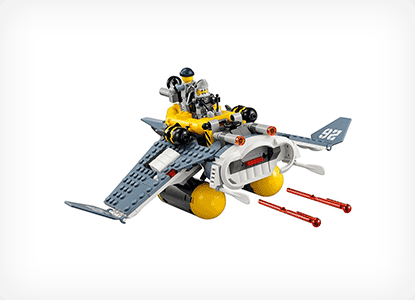 The Manta Ray Bomber building kit from the LEGO Ninjago Movie collection is just the thing for the most adventurous role-playing excitement! This set includes minifigures, weapons, and a detachable boat! Practice dive-bombing skills as you pilot this fighter! Will your Shark Army be victorious? Build it and find out! Two heads are better than one when you ride on a Fusion Dragon! Arrive at the Dragon’s Forge in Ninjago style and save the parents! This building set includes all the detailed accessories — even the snakes! — to make your tabletop adventure as exciting as the LEGO Ninjago Movie! Get the Salvage M.E.C. building kit and prepare for hours of LEGO entertainment! Exercise your imagination while you exercise your right to have fun! Detachable skateboard and flyer to help Ronin make a safe getaway! Is the Skulkin Mech a worthy adversary? Build it and you’ll find out! Here’s the complete set of LEGO Ninjago Movie characters! Twenty collectible mini-figurines are perfect for a super Ninjago holiday display or for hours of imagination-fueled LEGO play! They have all their accessories for action-packed fun, too! You be the director for this incredible cast of the year’s hottest LEGO movie! Who says lightning never strikes twice? Strike twice, thrice, as often as it takes to restore the balance of power in Ninjago world with this Lightning Jet building set! Six minifigurines are included to add life to your playtime. Fueled by imagination, built by you — LEGO continues to impress! Officer Toque and his police tuc-tuc vehicle are just in time to save the day at the Food Stall! With the Ninjago Movie City Chase building kit, you can recreate his finest moments! Detailed accessories include cherries, apples, and fish! Turn Ham’s frown upside-down and let’s get back to business! Mastering Spinjitsu is child’s play with the LEGO Ninjago Movie Spinjitsu Training building kit. Kai and Zane are included with dojo, weapons, and Garmadon combat dummy to help them improve their skills for exciting tabletop battles. Put your own skills to the test! Just imagine — you’re the sensei now! When Garma Mecha Man threatens Ninjago City, who comes to the rescue? Build the villain and stage your own battle! You be the hero and direct the included minifigures in all the action imaginable! LEGO building kits provide everything you need to recreate your own version of The Ninjago Movie! Ahoy, mateys! You’ll feel like you’re on the set of the LEGO Ninjago Movie when you build the Destiny’s Bounty! Seven minifigures help you crew this highly detailed ship worthy of the Seven Seas, but right at home on your tabletop! Weigh anchor with this ready-for-action building kit and set sail! When every second counts, power up your LEGO Samurai VXL and head for the swamp! This LEGO building set includes the battle-ready Samurai VXL vehicle with performance tires, detailed cockpit, intimidating weapons, four minifigures, and a mysterious Vermillion Egg! Enjoy all the movie action without leaving the comfort of home! What features a missile-launching eye, twitching tail, and spinning Time Portal? If you said the Ninjago Movie Snake Mech, you’re right! Add in the swamp fort, action minifigures and weapons, and you’ve got the LEGO Dawn of Iron Doom building set! Here’s the best interconnecting building block system on earth! Jay’s Elemental Dragon is designed for maximum fun! Posable parts, snapping jaws, and Pirate flyer put you in the heart of the Ninjago Movie when you build this formidable machine! Jay and Cyren minifigures are included to help you stage the best battle ever! LEGO — it’s what’s for playtime! Are you brave enough to visit Tiger Widow Island? Will you escape in Sensei Wu’s hot air balloon? Watch out for the giant spider! Imagine the adventure you’ll have when you construct the LEGO Ninjago Tiger Widow Island building set. Minifigures and accessories complete the kit for hours of fun! Even the most rugged terrain won’t deter the agile Ninjago Rock Roader vehicle! LEGO is the go-to for quality interconnecting block building sets. Including the Stone Army Base Camp, minifigures, weapons, and accessories, when you build the Rock Roader, you’ll be ready to roll into your next Ninjago adventure! Pilot Zane’s Flyer to the rescue in this action-packed adventure when you build the LEGO Raid Zeppelin airship. Detailed zeppelin includes a pirate cannon, fold-out wings, and an adjustable pirate flag! Minifigures and weapons complete the package for this exciting above-the-clouds battle! You can be the hero of Ninjago City! Here’s everything you need to stage a thrilling contest of ninja skill and cunning. Be the first to bring home the amazing LEGO Ninjago Lighthouse Siege building set, complete with all the minifigure characters, accessories, and weapons to bring this daring battle to life! Watch out for the collapsing floor! Will Lloyd and his jetpack out-maneuver Flintlock who is piloting the high-tech Sky Shark, complete with opening cockpit! Ninjago excitement takes to the air with this building set designed for fast-paced dogfight scenes. LEGO knows you appreciate fine detailing in design, weapons, and performance when it comes to awesome fun! Are you clever enough to break out of the LEGO Ninjago Kryptarium Prison? Find out with this exciting Kryptarium Prison Breakout building kit! Minifigures include a prison guard who must be restrained and a four-armed Giant Stone Warrior! Tension builds as you race to escape before the prison gate drops! Is there any end to the chases, escapes, and near-misses in the thrilling Ninjago saga? Add to the fun with the LEGO Ninjago Bike Chase building set! Kai and Nya go head-to-head, battling each other as well as the terrain! Build it and find out who has the skill to win! Put your imagination to work with this repurposed glass DIY pencil holder! Not only are you doing the environment a favor, you have endless options to create your favorite characters from The LEGO Ninjago Movie! Don’t stop there! You can add fun expressions, too! Make several for gifts and yourself! When you take cube-shaped bulbs, acrylic paint, vinyl stick-on faces, and your creativity, you’re set to deck the halls with a LEGO-themed Christmas tree! You’ll have fun creating one-of-a-kind ornaments to accent a LEGO colored paper chain, and actual LEGO creations. Voilà! Now you’re ready for a very LEGO holiday! Take a budding engineer, a dash of curiosity, and LEGO interconnecting building bricks — you can create anything! Like this year’s hottest gadget, the Fidget Spinner! Easy-to-follow directions and your choice of bricks give you limitless ability to build Fidget Spinners in various colors to match any outfit or decor! LEGO interlocking building blocks is the most fun kids of all ages can have building, demolishing, and rebuilding fantasy worlds! Here’s a nifty do-it-yourself project to enhance playtime and minimize clean-up. Convert an IKEA table into a LEGO wonderland with baseplate surface and tubs to hold those famous blocks! Win-win! What do you give the guy who has everything? How about a LEGO Candy Jar? Here’s a great do-it-yourself idea that repurposes jars and puts old LEGO minifigures back into circulation! These make swell gifts! Add candy and personalize for that just-right touch that says you’re giving from the heart! Have LEGOs, will travel! You can make a personalized travel case with compartments for your child’s minifigures and accessories, as well as LEGO interlocking building blocks. A LEGO baseplate lid doubles as a portable play surface. This DIY project will make you the biggest hero to your little LEGO fans! It’s never fun to color with broken crayons. But they always seem to break. With a little imagination and a silicone mold, you can transform broken colors into LEGO instruments of art! With adult supervision kids can make their own combinations or single-color crayons shaped like their favorite LEGO minifigures or blocks! Gift-giving is more fun when your thoughtful gifts arrive in these adorable do-it-yourself LEGO gift boxes! Downloadable templates and a few simple tools are all you need! Whether you’re a master crafter or just starting out, these colorful replicas of everyone’s favorite interlocking building bricks make your gift stand out! Little hands and curious minds are both kept busy when you take on this fun and simple project! LEGO interlocking building bricks and balloons are the basis for this exciting DIY activity! Build cars, race them, figure out the science! Fun, family, and learning will make this a favorite memory! LEGO interconnecting building kits and their accompanying minifigures have been loved by generations of LEGO fans. So what do you do with 150 minifigures? These collectibles deserve a dedicated shelf of their own! Here’s a fabulous do-it-yourself idea for building an inexpensive display for your or your child’s priceless treasures! You can’t eat LEGOs, but you can use them to build a clever candy dispenser that actually works! Choose your favorite sweet treats and follow these instructions. You’ll be the envy of your friends! They may want you to make dispensers for them! What else can you dispense? Surprise yourself! When you’ve built all the LEGO buildings you can build, what’s next? How about sporting this nifty LEGO costume? A few crafty items and you’re ready to take a plain cardboard box out of the recycling bin and into playtime for all the LEGO fun you and your little builders can imagine! Help keep Gotham safe with this awesome collection of LEGO Batman sets. With all of his cool vehicles, gadgets and more included, you can have endless amounts of fun defending the city from some of the most dangerous villains. Your collection is incomplete without at least one of these LEGO Black Panther sets. Full of excitement and adventure, these toy sets have harnessed the joy and fun of the films and condensed it into LEGO form. Check it out now. Whether you’re an avid LEGO collector or just a fan of the movies, these LEGO Jurassic World sets are something you need. We’ve got everything from minifigures, mini dinosaurs and enclosures to keep them in. There’s even a couple of ACU officers, in case the dinosaurs manage to escape! LEGO brings us into a world of dinosaurs and adventure in these action packed sets! Watch your child spark their creativity as they learn about different dinosaurs and build their way to fun! A great way to get them into hands on, interactive play while challenging them to build a better world! LEGO City really is the toy you can build on! Each set can be used alone, or added to other LEGO City playsets to create ever bigger adventures. The fun never ends with LEGO City – the only limit is your child’s imagination. LEGO gives us a world of friendship and fun in these amazing Friends playsets. A great way to inspire creative play, these toys are building imaginations everywhere!